This species is accepted, and its native range is S. Canada to NE. Mexico. Perennial; caespitose. Rhizomes short; knotty. Culms erect, or geniculately ascending; 40-75 cm long. Leaf-sheaths glabrous on surface, or pilose; outer margin hairy. Leaf-sheath oral hairs ciliate. Ligule a fringe of hairs. Leaf-blades 15-40 cm long; 3-7 mm wide. Leaf-blade surface glabrous, or pilose; hairy on both sides. Inflorescence a panicle; deciduous as a whole; exserted, or embraced at base by subtending leaf. Panicle open; oblong, or ovate; effuse; 25-45 cm long; 15-30 cm wide; 0.66 of culm length. 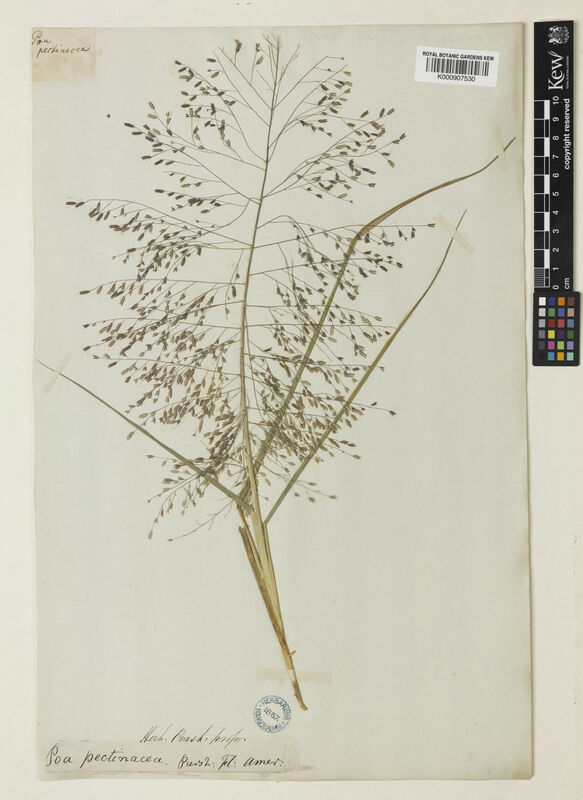 Primary panicle branches ascending, or spreading; 9-15 cm long. Panicle branches capillary; straight; scabrous; bearded in axils. Spikelets solitary. Fertile spikelets pedicelled. Spikelets comprising 7-11 fertile florets; with diminished florets at the apex. Spikelets linear, or oblong; laterally compressed; 5-7 mm long; 1.5-2 mm wide; breaking up at maturity; rhachilla deciduous; disarticulating below each fertile floret. Rhachilla internodes eventually visible between lemmas. Glumes deciduous; similar; shorter than spikelet. Lower glume ovate; 1.4-2 mm long; 0.9 length of upper glume; membranous; 1-keeled; 1 -veined. Lower glume lateral veins absent. Lower glume apex acute. Upper glume ovate; 1.6-2.2 mm long; 1 length of adjacent fertile lemma; membranous; 1-keeled; 1 -veined. Upper glume lateral veins absent. Upper glume apex acute. Fertile lemma ovate; 1.8-2.2 mm long; chartaceous; purple; keeled; 3 -veined. Lemma lateral veins prominent. Lemma apex acute. Palea keels ciliolate. Apical sterile florets resembling fertile though underdeveloped. Caryopsis with adherent pericarp; ellipsoid; 0.8 mm long; dark brown. North America: eastern Canada, northwest USA, north-central USA, northeast USA, southwest USA, south-central USA, southeast USA, and Mexico. Megastachya spectabilis (Pursh) Roem. & Schult. 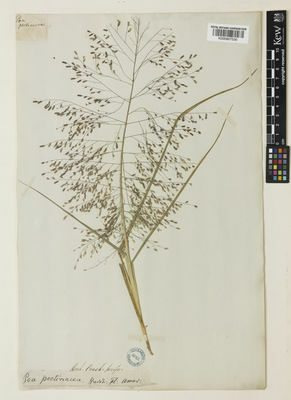 Poa hirsuta var. spectabilis (Pursh) Torr. Poa pectinacea Geyer ex Steud. Poa villosa Beyr. ex Schrad.